Bill Troy raises an interesting discussion on the future of Quality on ASQ’s blog “A view from the Q”. Will Quality change arise by Revolution (leaps and bounds) or Evolution (inch by inch). It is an important question as the world’s premier Quality organization plans and prepares for the steps forward into the next era of Quality advancement. 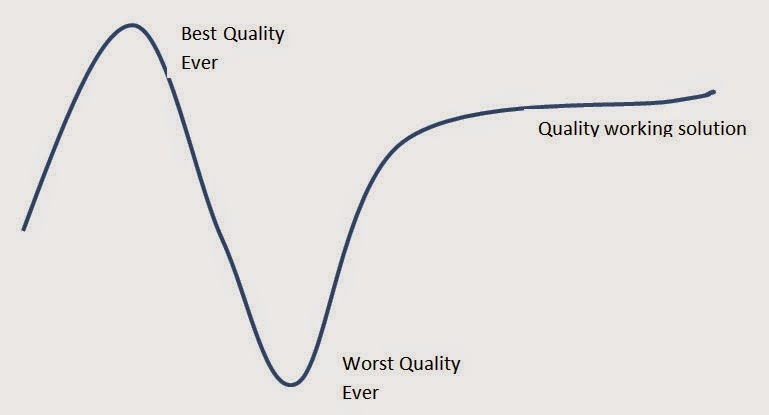 Discussion on the progress of Quality reminds me of a discussion with my mentor almost 40 years ago. We were talking about the creation, rise, and fall of new antibiotics. As new drugs come along they go through a certain predictable path; first they are the newest and hottest silver bullet, better than sliced bread. With the first few treatment failures or complications, they almost immediately reverse direction and are viewed as terrible and trash, even worse than poison. But over time we learn to recognize that these agents are neither perfect nor poison, and fall into their own individual niche within the armamentarium of treatment agents. He called it the sine wave of medical progress. In my experience this is a commentary not only relevant to chemotherapy, but applies generally. We have seen Six Sigma touted both high and low in our own Quality Progress, but it continues on as a valuable tool in the Quality Tool Box. We have seen ISO 9001 declared as “broken”, yet it too remains as a valuable standard for implementing Quality. And in 2010 writers in the Wall Street Journal wrote “What do weight-loss plans and process-improvement programs such as Six Sigma and "lean manufacturing" have in common? They typically start off well, generating excitement and great progress, but all too often fail to have a lasting impact as participants gradually lose motivation and fall back into old habits.” But Lean is not dead, and many see great value. Attitudes come and go as people jump on and off the bandwagon of what’s hot and what’s not. But the Quality movement continues on because society sees inherent value in confidence and competence and understands the true importance and security and safety that the Quality process brings. Change will come because nothing remains static. Some will result as old guard folks retire and are replaced by newer, younger voices that emerge. Some will come as we attempt to fine-tune the subtleties within our standards. Some will lurch onto the scene with new technologies. But let me argue that ultimately change will not be driven just from within the professional community because the real driver of change comes from public demand on one issue or another. Want to know the future of Quality? Keep your ear close to the ground and listen to what your customers, your workers, and the public are talking and maybe even complaining about. Quality change evokes better solutions. Very good! I think that the only way is to work with people! Behavior, motivation, communication and change management are the keys for any quality program or tool.